Phoebe, a deacon from the Cenchrea church, trudged up the streets of Rome, looking for the house of the well-known Christian leaders Priscilla and Aquila. She had agreed to deliver a letter to the church in Rome on Paul’s behalf while there on business. After nearly an 800-mile journey from Corinth, Greece, Phoebe had arrived in the mighty seat of the Roman Empire holding nothing less than what would become one of the mightiest books of the canon. What was so urgent that Paul needed to write to the Christians in Rome? On the one hand, Paul was laying the groundwork for his upcoming visit as well as preparing his readers for future requests to help in his church-planting efforts. After leaving Corinth, Paul planned to travel east to Jerusalem and then reverse course and head west to Spain. On the way to Spain, he would stop in Rome to meet the Christians there and seek their help for the Spanish mission. This was not the only reason, however. If Paul simply wanted to send greetings and alert the Roman church that he would like their help in future missions efforts, he didn’t need to compose such a magnum opus. Why did he do it? What was the purpose of this massive theological treatise? Why did he choose this letter to explain his theology more fully than he did anywhere else? What does this theological book have to say to us today? These are the ultimate questions of Romans, written by the Apostle to the Gentiles in the greatest Gentile city of the day. Join us in a study of this life-altering work from Paul, the Apostle to the Gentiles. 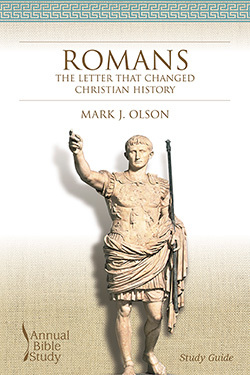 Many of the greatest Christian leaders have been transformed by their study of Romans. Explore this influential book of the Bible with the Annual Bible Study. Both the Teaching Guide and Study Guide, which are illustrated with art images, photos, and maps, were written by Mark J. Olson, pastor of Snyder Memorial Baptist Church in Fayetteville, NC. Each chapter in the Romans Teaching Guide includes teaching options, a suggested worship outline, and approaches for leading discussions. The study examines biblical background, history of interpretation, and the themes of spirituality, ministry, and theology. It also includes relevant lesson plans for children and youth. The Romans Study Guide serves to educate the learner on major issues of appropriate interpretations, to offer an overview of theological themes, and to build the learner’s Bible study skills by considering several significant interpretations. 1. Good News or Bad News? 3. The Christian Life: Battle with Sin or Victorious Conquest? 2. Good News or Bad News? 4. The Christian Life: Battle with Sin or Victorious Conquest?